A disease without cure, screamed headlines, and the population of Kerala went into panic mode. 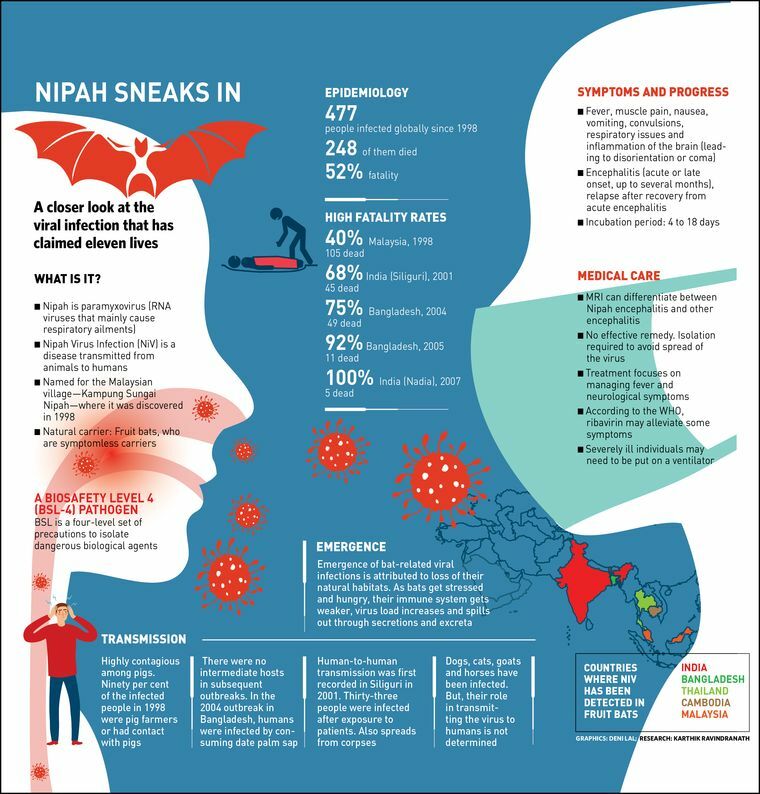 The news of deaths in the state caused by the Nipah virus—11, as of May 23—led to widespread fear. Fruits are forbidden, and people from Kozhikode district, where the Nipah Virus Infection (NiV) broke out, are facing social quarantine. This continues even after the state health minister, K.K. Shylaja, said the outbreak had been contained. There is reason to worry as the NiV has a fearsome track record. Said Dr Jyothsna Krishnappa, senior consultant, internal medicine, Apollo Hospitals, Bengaluru: “The infected person goes through myocarditis and encephalitis [inflammation of the heart and brain] and the infection is fatal.” Krishnappa added that respiratory secretions appear to be particularly important for person-to-person transmission of NiV. Its fatality rate, according to World Health Organisation data, is 52 per cent. It touched 100 per cent once (see graphics), and crossed 65 per cent on half a dozen occasions in the last two decades. So, why is there still no antidote? Joshy Jacob, associate professor in the department of microbiology and immunology at the Emory School of Medicine, Atlanta, said that it is possible to develop a vaccine against Nipah. “It is a paramyxovirus,” he said. “We have successful vaccines against other paramyxoviruses such as mumps and measles.” Jacob said there was already a licensed equine vaccine in Australia. This is for use against the Hendra virus—a bat-borne virus that infects horses and humans. Hendra and Nipah viruses have been classified into a new genus called Henipavirus. The reason there is no human vaccine against Nipah, said Jacob, is because taking a vaccine through clinical trials and getting it approved would cost a lot, and there is no big market for such a vaccine in the developed world. Jacob said it is hard to tell what could have caused the outbreak in Kerala. “We need to find the index case—the first known person who got infected—and trace his path to see how exactly he got infected,” he said. Jacob added that these infections usually die down once people are educated on how to prevent exposure and transmission. However, he recommended a whole genome sequencing of the Nipah virus currently circulating in Kerala. “That is to make sure it is the same virus as from previous years and not a mutant virus that has just emerged and is transmitted easily from human to human,” he said.